The month of May has become a time when we connect with, serve, and share the gospel with our community in a significant way. On Thursday night, May 10, we will host the Academy for Classical Education Honors Program in our Worship Center. 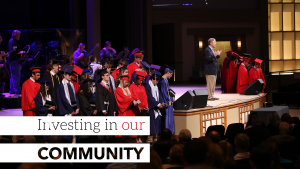 On Thursday night, May 17, we will host the Covenant Academy Commencement in our Worship Center. On Saturday afternoon, May 19, we will host the First Presbyterian Day School Commencement in our Worship Center. On Monday night, May 21, we will host the Tattnall Square Academy Commencement in our Worship Center. I am thankful that on each of these occasions Ingleside staff members and a host of volunteers serve people in our community joyfully in the name of Jesus. Some serve in the parking lots, others serve as greeters and ushers, others serve in the bookstore and cafe, and others serve on our production team (sound, lights, video). Our goal at each of these events is to serve families in our community with excellence and in the Spirit of Christ as they celebrate a significant milestone. Why do we make this investment? Is it consistent with our mission? The answer is “yes” for at least a couple of reasons. First, these occasions give us an opportunity to connect personally with hundreds of people who might not otherwise have occasion to come to our campus. Every year our team shakes hands with people from all across our community. And, some of them, having been on our campus once, will return to connect week-by-week with the ministries of our church. As they do, their lives will be transformed by God’s grace. Second, these occasions also allow us to share the gospel. At every event, one of our pastors offers a welcome and, in a winsome way briefly shares the gospel of Jesus Christ. In fact, if a school wants us to host their end-of-year event, we will do so only if we can share the gospel and invite those in attendance to Ingleside. We are not just another venue; we are committed above all to the Lordship of Jesus Christ. I am thankful to be part of a church that cultivates connections to our community for the purpose of sharing the gospel, making disciples, and building the church. I know the Lord is pleased.